Got a head of cauliflower? 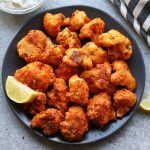 Make these amazing healthy buffalo cauliflower wings with just a few simple ingredients for the big game. These healthy cauliflower buffalo wings are especially delicious dipped in a homemade healthy blue cheese dip. It’s currently Friday and I’m writing this post a few days before a HUGE game for the Minnesota Vikings. As you know, I am a Wisconsin girl, so my heart lies with the Packers, HOWEVER…I have lived in Minnesota for almost 10 years, so if the Vikes are doing well in the playoffs, I can’t help but cheer for them. On top of that, the Superbowl is actually in Minneapolis this year in just a couple of weeks. I mean, how cool would it be to have our home team playing AT HOME during the Superbowl? I’d be pretty psyched. The only downfall is that I am going to be skiing in Breckenridge that weekend, so I technically won’t be home in Minneapolis. WHOMP. Believe me, I didn’t choose the date of that trip. I bring this very special day up for a very special reason. 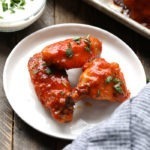 If you’re a buffalo wing kind of person, then this is your recipe! It’s made with good-for-you ingredients and 100% guilt-free. 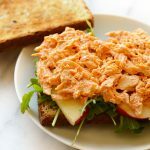 This buffalo cauliflower recipe is also gluten-free, dairy-free, and grain-free! Don’t think for a second that these cauliflower buffalo wings look intimidating to make because they’re not! They only require a few steps and…they’re baked not fried! Chop Cauliflower: bite-sized is the right size! Egg Wash: You’ll need to crack a few eggs to create an egg wash so that you can toss the cauliflower wings in it so that the rub sticks. Rub: Speaking of rub, we used an almond meal base for the rub along with some delicious, smokey spices in order to amp up the flavor. 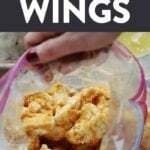 Bake: Once all of your cauliflower wings are fully coated, it’s time to bake! Bake at 400ºF for 20 minutes. I wouldn’t go any cooler than 400ºF. The hotter and faster the better. Buffalo Sauce: Now, t’s time to make your buffalo sauce. This is a buffalo cauliflower recipe after all. Franks and maple syrup make up this healthier buffalo sauce. Toss: Once your cauliflower buffalo wings are done baking, it’s time to toss in the sauce. Easy peasy! Got a head of cauliflower? 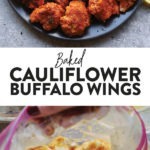 Make these amazing healthy buffalo cauliflower wings with just a few simple ingredients for the big game. These healthy cauliflower wings are especially delicious dipped in a homemade healthy blue cheese dip. Preheat oven to 400ºF and spray a baking sheet with olive oil cooking spray. Prep cauliflower, but cutting into “wing-sized” pieces. Set aside. Make rub my mixing together almond flour, garlic powder, smoked paprika, salt, and pepper. Transfer into a gallon-sized bag. Then, crack 2 eggs in a bowl and whisk. Dip cauliflower into the egg mixture and thoroughly coat. Then transfer into gallon-sized bag. Repeat with all pieces of cauliflower. Shake bag so that the cauliflower gets coated with rub. Transfer cauliflower onto baking sheet and spread out evenly. Spray cauliflower with olive oil cooking spray or alternatively drizzle on some olive oil. Bake at 400ºF for 20 minutes. Remove and flip cauliflower. Bake for 10 more minutes. While cauliflower is baking, prepare buffalo sauce. Mix together Franks and maple syrup. When cauliflower is done baking, toss in buffalo sauce, making sure all pieces are coated. Place cauliflower back on baking sheet and then bake at 400ºF for 3-5 more minutes. Prepare blue cheese sauce, by mixing together all ingredients. Nutrition does not include blue cheese sauce.